I think I am starting to get crossed eyed from looking at the 'Roid Week pool so much! So much good stuff, it blows my mind. 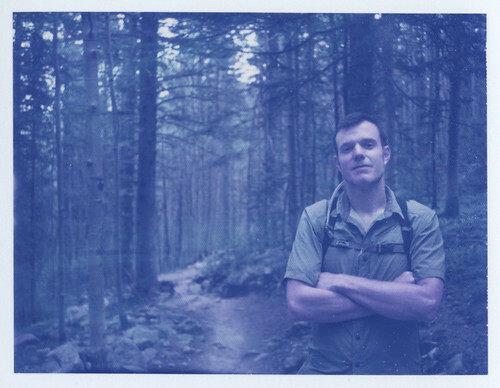 When I first used the Blue film, I wasn't too crazy about it so I let my second pack sit around for years. Recently Artful Magpie posted a great Blue shot on Flickr, and it inspired me to use my remaining pack. And boy am I glad that I did! I totally fell for the film and it suited our hiking adventure well. We were up on the Windsor Trail when I took this shot of Will. It's my favorite from the day. 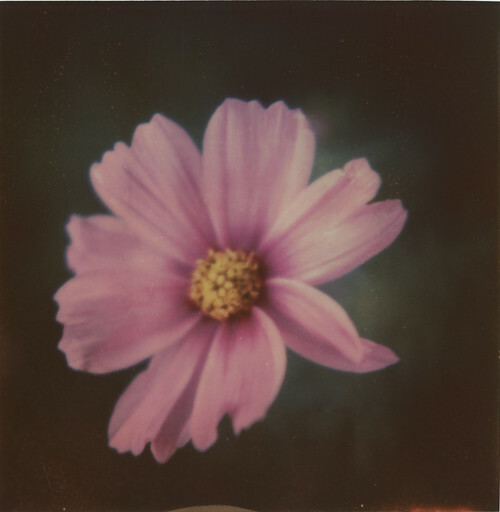 This is a shot of a cosmo in our garden. A typical Juli shot, I suppose. Flowers! I actually shot this one without shielding the film as it ejected so I was quite surprised that it turned out with such vibrant color. My land camera is FILTHY!! So much so, that film won't even pull through...shamefully admitting to never having cleaned the camera, didn't know I should.